This was my view from the roof at my office two days ago. I wish we could get up there all the time. It’s a nice view and it could provide us with photo ops. If you are not an amateur radio operator or public safety scanner enthusiast, stop reading now. I came to Ada in October 1988 to work as the Chief Photographer at The Ada News, and immediately made myself at home in my new darkroom. Our building is a sturdy girder-roofed structure with plenty of steel in the frame. As a result, the police scanners I used every day in my work could hardly hear the transmissions I needed to monitor. For several years I put up with this, but one day I was poking around and discovered a vent in the office next to mine that lead directly to the roof. If I could get on the roof I could stick a scanner antenna up there and hear signals from many agencies many miles away. I went to Radio Shack and bought three of their cheap but reliable model 20-176 VHF/UHF scanner antennas. I attached them to the roof vents with big hose clamps, and ran the feed lines, the cheap RG-58 they had at Radio Shack, through holes I drilled in a concrete beam, into my office. 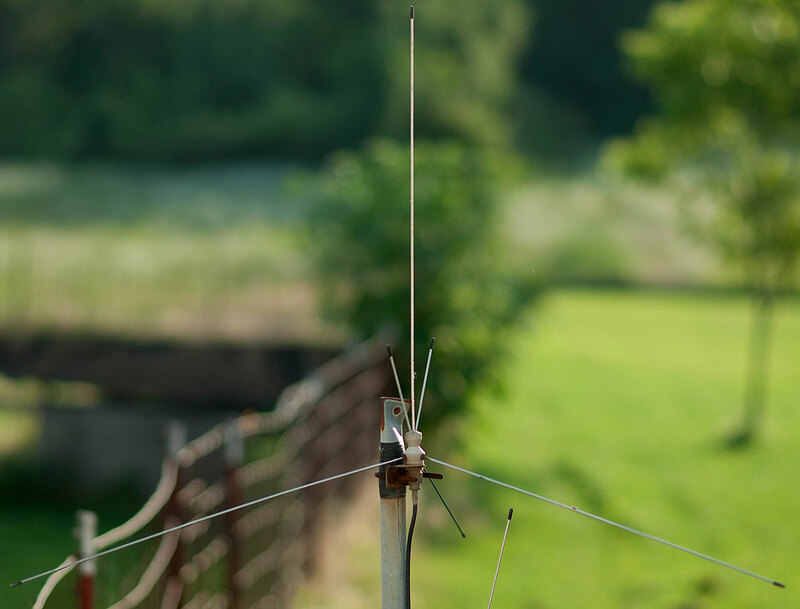 This is the antenna in question, widely regarded as a bargain for both monitoring and for amateur radio. Like Radio Shack itself, it is out of production. Years of satisfying scanner listening followed, until a year and a half ago when the air conditioner in the darkroom died, and I moved to a different location in the building. The antennas stayed up there until two days ago. I probably would have left them there forever except for one thing: I accidentally bought two vintage police scanners on eBay. Accidentally? If you are an eBay user, you know that it’s fun to poke around and see what’s out there, even if you have no intention of buying anything. I was doing just that when I came across a couple of neat old police scanners. I don’t need any more scanners, but what the heck, I’ll bid $15 just for kicks. Three days later, they were at our doorstep. Coworker LeaAnn made this image of me on the roof. I stepped from our RV to the lower portion of the roof, then used a short extension ladder to get to the very top. Getting on the roof at my office is not without peril. In 1998, our then-Publisher was seriously injured when he fell from a ladder that collapsed beneath him. 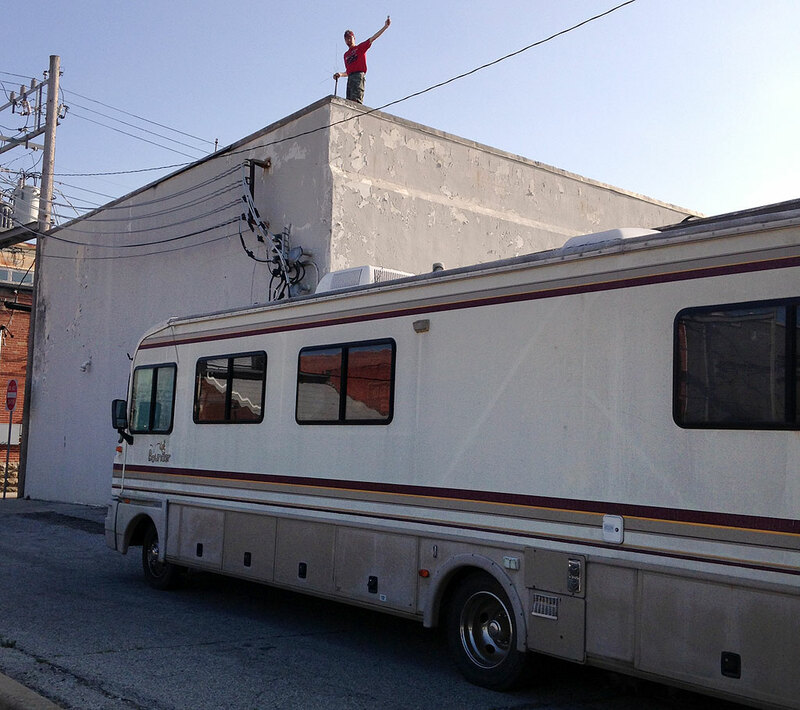 I devised a scheme to drive our RV to town and use it as a house-sized ladder. 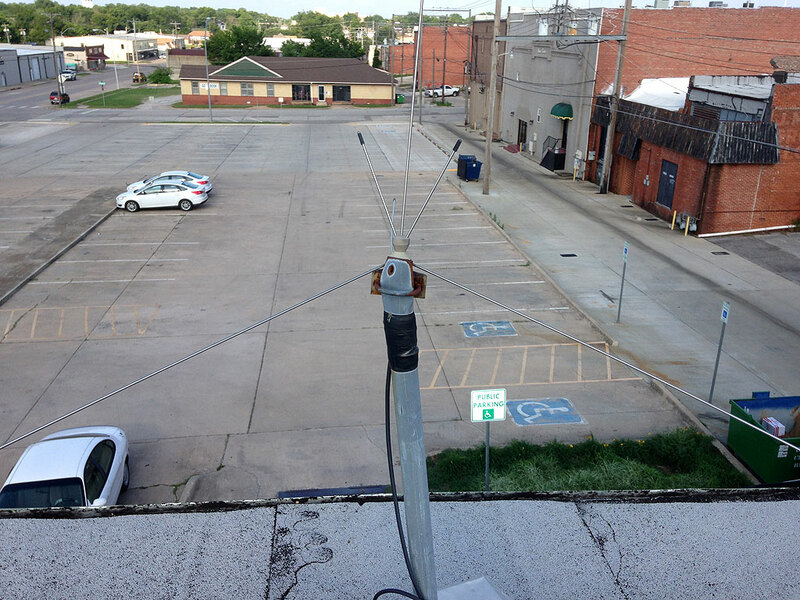 Sure-enough, it worked like a charm, and I was able to step across onto the roof with ease. While I was up there LeaAnn, a coworker, came out the back door to find our giant RV in the alley. She was quite startled when I called to her, but she ended up photographing me in my quest. Everyone in town, including LeaAnn, knows that there is nothing on which I won’t climb or in which I won’t fly. 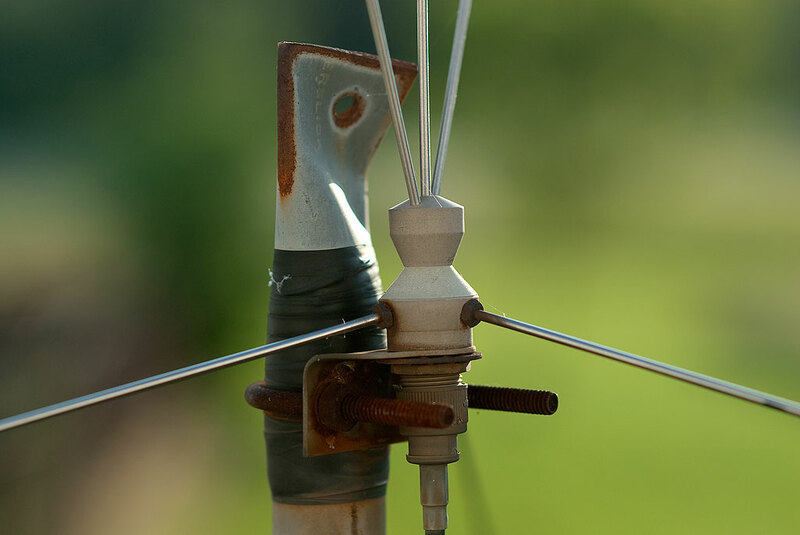 The antennas’ stainless steel elements were in pretty good shape, but the mounting hardware was well-rusted. I took all three home and took them apart and cleaned them, including dropping the rusted mounting brackets into some motor oil to remove some of the rust. I plan to install a couple of them on the north end of the house above the window in the garage, with feed line running down to scanners on the workbench. Abby is mildly annoyed by the hobby, so I can experiment freely in the garage, with radios and antennas that cost very little. I’ll keep the third one unmounted for the moment; I might experiment with it or modify it. Finally, I got to climb something. Mission accomplished. This is the base of one of the antennas I plucked from our office roof right after I got them home. As you can see, the non-stainless parts were fairly corroded, but they cleaned up nicely.